Hannah Heacox pitched a complete game one-hitter against Dominican. ROCHESTER, Minn. – The Gustavus softball team began the 2017 campaign with two wins in a non-conference doubleheader Saturday evening at the Rochester Regional Dome. The Gusties defeated Dominican University 5-0 and Martin Luther College 8-0, backed by two complete game pitching performances. Co-Captain Hannah Heacox (Sr., Stillwater, Minn.) led the Gusties in the season opener against Dominican. Heacox started on the rubber and pitched a complete seven innings, allowing just one Dominican hit along with 10 strikeouts in the 5-0 victory. Heacox also led the offense, knocking in two RBI. A four-run third inning proved to be the factor as the Gustie defense held strong throughout seven innings. After leading off the inning with a single, Brooke Willemsen (Sr., Hamburg, Minn.) came around to score off another hit from Emily Webb (So., Maple Lake, Minn.), which would stand as the game-winning hit and run. A Heacox double added another two runs while an illegal pitch by the Stars pushed the Gustavus lead to 4-0. Kim Kurtzweg (Jr., Arlington, Minn.) singled in the sixth inning, scoring Ashley Hoffman (So., New Prague, Minn.) as the Gusties solidified the 5-0 lead. Webb (2-4, 1 R, 1 RBI, 2B), Heacox (2-4, 2 RBI, 2 2B), and Willemsen (2-3) led the Black and Gold offensively to give the Gusties their first win of the season. Additionally, Aly Freeman (Fy., Omaha, Neb.) and Sarah Pederson (Fy., Blaine, Minn.) picked up hits in the first career games. 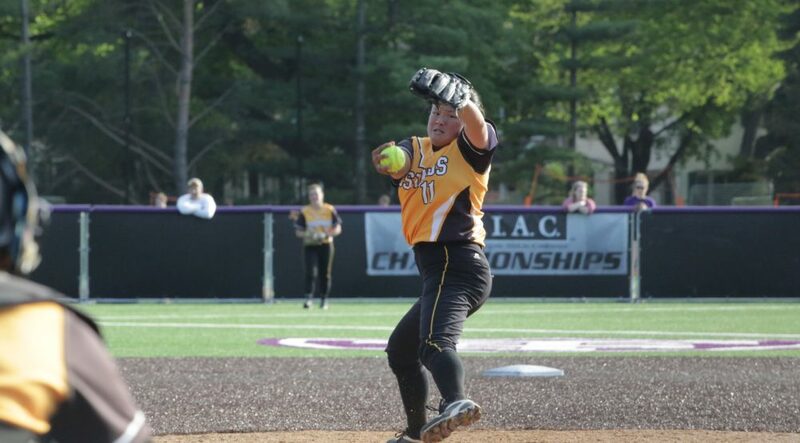 In game two, the Gusties were provided with another complete game performance in the circle as Jena Willis (Sr., Kalispell, Mt.) went five innings and notched five strikeouts, allowing just one Martin Luther hit. She also posted two base hits at the plate to help Gustavus improve to 2-0 on the season. Gustavus scored two runs off two hits in the second and six runs off five hits in the fourth to take down the Knights in five innings. Four Gusties posted multiple RBI performances while six batters picked up at least one hit. The offense was led by Heacox (1-3, 2 RBI, 2B), Willis, (2-3, 2B), Emily Carlson (Fy., Burnsville, Minn.) (2-2, 2 RBI), Jessica Neuman (Jr., Elk River, Minn.) (1-2, 2 RBI), and Ashley Beise (So., Loretto, Minn.) (1-1, 2 RBI, 2B). The Gusties return to the Rochester Dome next weekend, set for two additional non-conference doubleheader matchups. The face the University of Wisconsin-Eau Claire and the University of Dubuque Friday, then play Dubuque and Grinnel College Saturday.